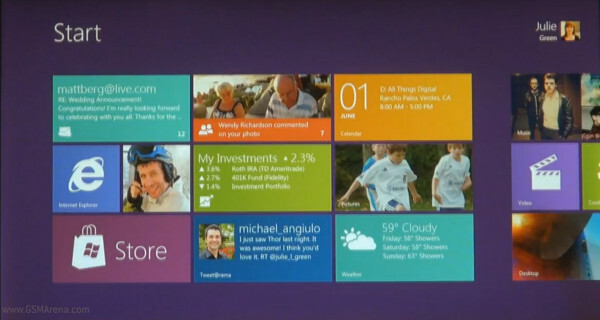 Microsoft showed off its progress with Windows 8 at the D9 Conference as promised. A 4 minute video demonstrates how they’ve broken away from the interface that has been slowly evolving since Windows 1.0 and they’ve gone for something that looks a lot like Windows Phone 7. The major change here is the Start screen – that’s right, gone is the iconic Start menu, replaced with a tile-based screen, much like the WP7 one. Instead of shortcuts, apps get a tile, which they can use to display various relevant info. Microsoft made it clear that they’ve showed only a part of the work they’ve done so far – Windows 8 supports native apps that run on Windows 7. Once you start a native app, you’re dropped out of the tile-based interface and into something that looks just like the Windows 7 desktop. It’s interesting how Windows 8 handles multitasking as well – a swipe on the screen moves between full screen apps. A neat trick is that if you don’t swipe all the way through, you can dock an app so that the screen is split between both apps and you can readjust the split later. That trick works with native and HTML5 apps though if you mix them it looks kind of unnatural. Microsoft was also quite proud of the touch-optimized Internet Explorer 10 and split keyboard (like the one in the earliest Origami concept). The Start screen of Windows 8 featured a store icon, though Microsoft didn’t say anything about it (Apple has a PC app store and Microsoft wants one too it seems). More videos detailing more features will be posted in the coming months. For now check out this first video. One thing bothers me though – Microsoft claims that Windows 8 works equally well on touch-based tablets (which the video shows well enough) but also on laptops and desktops with a keyboard and mouse. I’m not sold yet – if I run Windows 8 on a laptop, will I be stuck with the Windows 7-like desktop only occasionally dropping into the tile-based UI, which looks bolted on? More videos I say! And more info on the non-touch interface please.